Portable design makes it the ideal table for students and professionals. With adjustable, therapeutic heating system. With two inches of multi-layer small cell foam. Fairlane Therma Top Portable Massage Table is a portable massage table with an adjustable heating system and two inches of cushion for a completely comfortable and therapeutic user experience. This massage treatment table stands on four sturdy Elm Hardwood legs and is finished with a rich, hi-gloss Dura Seal protected finish. Fairlane Therma Top Portable Massage Table has a 28-inch wide top, making it an easy to transport, assemble and disassemble portable massage table. Designed in a deep cinnamon color, this massage treatment table has an adjustable heating system to suit the preference of any user. 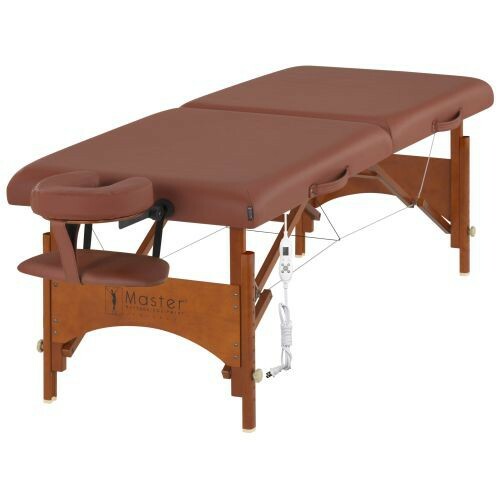 You might also be interested in similar portable massage table products that we carry, such as Stratomaster Ultralight Portable Massage Table. Premium portable massage table is perfect for students or professionals on a budget. Layered with a two-inch thick cushion of exclusive multi-layer small cell foam. 28 inches in width makes this very portable and easy to assemble and disassemble. Working Weight Capacity: 550 lbs. Patented, built-in Therma-Top heating system.